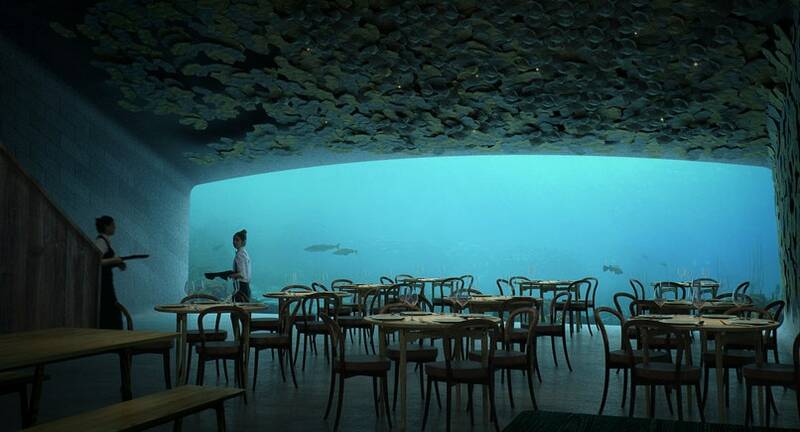 If you suffer from a fear of open waters (also known as Thalassophobia), then you should probably avoid making reservations at Under, Europe's soon-to-be first underwater restaurant. Designed by the Oslo- and New York-based firm, Snøhetta, the structure will be partially submerged within the North Sea, along the shores of Båly, in sourthern Norway. If any doubters of the building believe the design will harm marine life, the architecture firm has ensured the structure will do the exact opposite. By encapsulated the building in a concrete shell, the surface will invite mussels to cling to it. This means that, over time, Under will serve as an artificial mussel reef. And since mussels have the ability to cleanse the surrounding water by removing significant amounts of pollutants, the structure will help purify the sea and thus, attract more marine life. 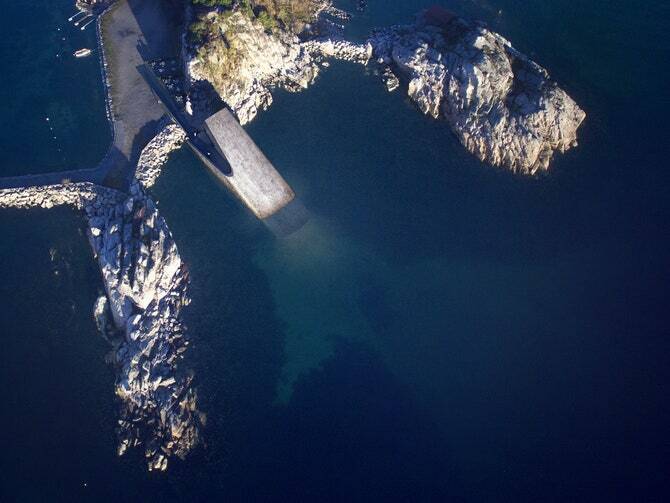 Visitors will enter the building along the craggy shoreline, before moving to the bar, which is located at the first level of the restaurant (it's here where the structure is first submerged below sea level). 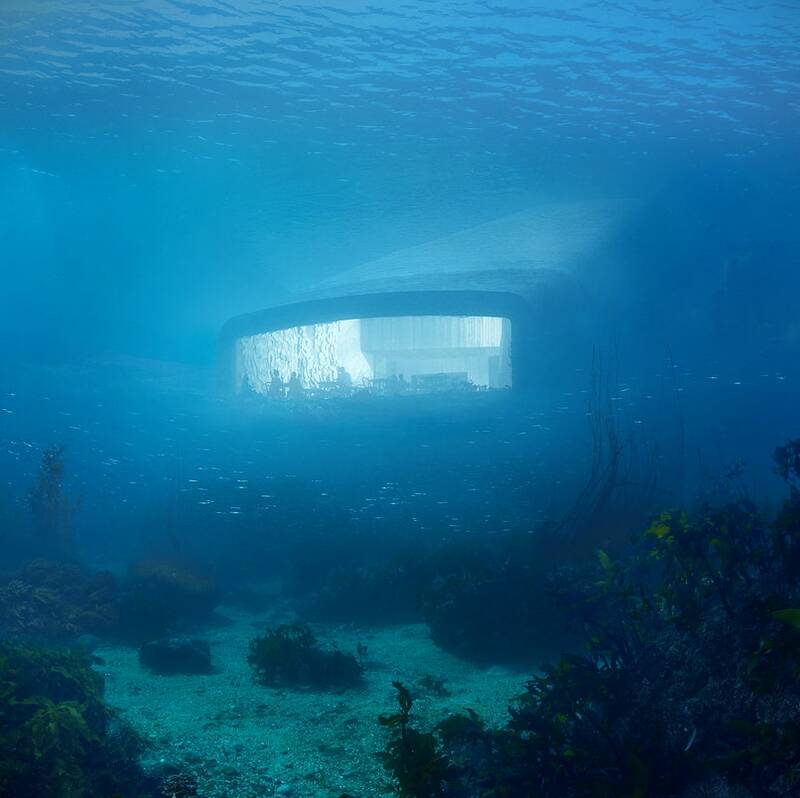 From there, guests can move down one more level, to the dining area, which opens up to an enormous acrylic window, framing the sea some seventeen feet under water. The walls of the concrete structure will be several feet thick, making it strong enough to endure the pressure and conditions from the rugged North Sea. While the building will primarily serve as a restaurant, the space will also be used as a marine biology research center. When Under is not open for business, "researchers from Norwegian research centers will seek to train wild fish with sound signals, and will study whether fish behave differently throughout different seasons," said Snøhetta in a statement. They could have put a fishtank up to do the same job.